Posted by Teresa Mihelic HelpDesk on Tuesday, April 17th, 2012 at 10:49am. There's always something going on in the city of Dana Point. We recently had the egg hunts events at two locations, Pines Park and Sea Canyon, with over 1000 kids showing up to the events. What a great turnaround. 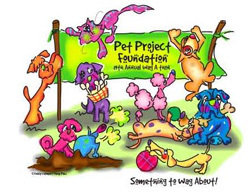 Now, this upcoming Saturday April 28th, The Pet Project Foundation is proud to have the 19th Annual Wag-A-Thon event. If you are a pet lover, here's yet another reason why living in Dana Point is a great idea. Opportunities to have Professional Pet Photos with “Bolt”, a St Bernard Mix from the Super Bowl VW Commercial. 4 K Walk around the island led by Bolt. Pet contests and prizes!!! Your dog or cat can compete in ' Best Pet Costume' or 'Best Pet Trick'. Stands with goodies for sale for your dog or yourself! Where? : Dana Point Harbor - at the Harbor Island. Admission Fee: $35.00 per person (Includes Admission, t-shirt, goody-bag, entertainment and refreshments for you and your pet while supplies last). Admission for additional family members $5 (limit 5) includes entertainment and refreshments. Children under three years free, Dogs of all ages are free! Here's a video from last year's event. Fun, fun, fun!! !